For many of us, the thought of maple trees conjures visions of crisp New England autumns, hillsides ablaze with orange and scarlet, and early spring sap-tapping expeditions. Maple trees, however, are surprisingly at home in places far from the wintry Northeast. One such place is Georgia, where several varieties of maples grow wild. These trees also provide welcome shade and interest to Georgia's home gardens. Although closely related to the New England sugar maple (Acer saccharum), Southern sugar maple (Acer barbatum) is much smaller. It also lacks the brilliant fire of its larger relative’s autumn display. A slowly growing tree, Southern sugar maple seldom exceeds 40 feet. It has smooth silvery gray bark and a round crown spreading up to 35 feet, making it a useful shade tree. During April, the trees produce hanging clusters of small yellow, green or brown flowers. Green summer leaves become orange, yellow or reddish-brown in fall. Southern sugar maple is far more tolerant of Georgia's heat and humidity than its northern relative is. It likes moist, acidic soil and struggles during drought. Prune young trees to establish the desired shape. Another relatively small tree reaching up to 40 feet, striped maple (Acer pensylvanicum) grows wild in Georgia's shady woodlands. Its short trunk has greenish bark with unusual white lengthwise striping that fades as the tree matures. In April and May, according to the Lady Bird Johnson Wildflower Center, striped maple produces noticeable drooping clusters of yellow-green flowers. Lemon-colored autumn leaves pair attractively with the green and white striped bark. Several wildlife species forage on the bark in winter. Plant striped maple in a partly shady to shady location with rich, moist, acidic, well-drained soil. Red maple (Acer rubrum) is the most widely distributed maple tree on the United States' East Coast, growing wild in Georgia's swamps and wetlands and along streams from Maine to Florida. While wild trees may top 100 feet, red maple cultivars seldom reach more than 60. Choose a cultivar proven to withstand Georgia's heat and humidity. During March and April, male red maples produce reddish-pink flowers, while females have red samaras (winged seedpods) in late spring. Fall foliage--usually a brilliant red--accounts for the trees' name, but it may be yellow or yellow-green. 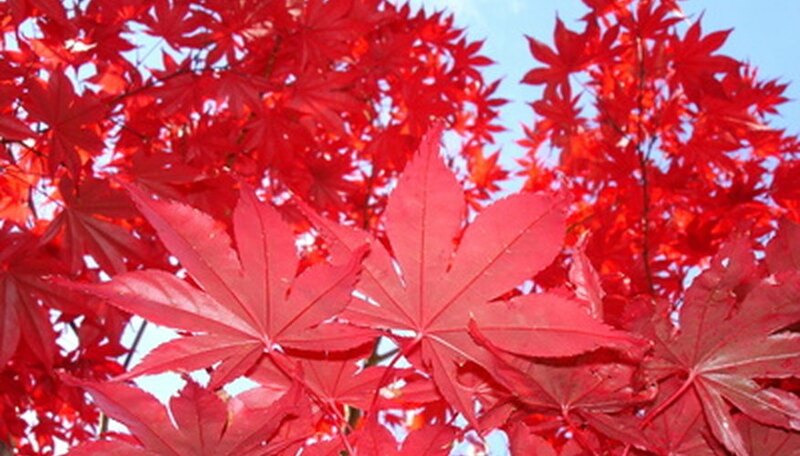 Plant red maple in moist acidic soil and sun to part shade. Trees have fibrous root mats that may prevent other plants from growing near their trunks.